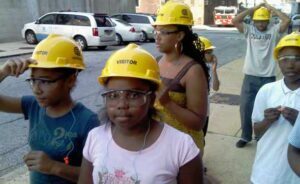 Young visitors on tour of a Con Ed steam plant. How many young people have seen the inside of a battleship, toured a utilities plant, met a bridge builder, developed a high-scale project, conferred with top-tier leaders in the energy field – all within the span of 6 weeks? Thanks to a wonderful experiential program developed by the American Association of Blacks in Energy, New York Metro Chapter (AABE-NYMAC), facilitated and hosted by Polytechnic Institute of NYU and supported by National Grid and Consolidated Edison, fourteen of our brightest stars, ranging in age from 11-14, received that experience plus a jump-start on the future. The Summer Energy Academy (SEA) for Children, hosted by NYU-POLY in Brooklyn, was designed to introduce our young people to the career possibilities that exist in the energy industry when they study science, engineering and technology. The SEA commenced July 6 from 8:30am to 3:00pm and concluded with a graduation ceremony on August 14. The daily curriculum, taught by college students, included discussions of basic electricity, energy conservation, green technology, elements of NYU-POLY’s YES and I2E programs. Program highlights also included the development of energy-focused team projects, field trips and tours, and lectures by leaders in the energy field. Earlier this year, AABE brought the idea of the SEA to NYU-POLY and that idea culminated in the successful graduation of fourteen students from AABE-NYMAC’s first energy- focused summer academy. “Some students have never been exposed to the science, technology, energy and math fields,” says Ms. Beverly Johnson, NYU-POLY’s Associate Dean of Undergraduate Admissions and Executive Director of YES Center. “Many students are not turned on to STEM careers until the late high school years. But this program starts with students in the early years. “We viewed this program as an excellent opportunity to work with our long-standing partners,” says Renee McClure of National Grid, adding, “AABE, Con Ed and Polytech, in not only educating our future generation on the energy industry, but also laying the foundation for our future workforce – what a winning combination”. The teams were Solar Arrows: Jalls Civil, Sarah Semple, Dom Gill, Tyree White and Diamond Small; Con Energy: Elijah Addison, Ibrahim Jihad, Joshua Franklin and Daweet McIntosh; and Energy Savers: Kayla Brown, Sabrina Johnson, Brianna Suggs, Alyssa Venable and Victoria Wilson. Ms. Lima A. Jones of Con Edison, and member of AABE-NYMAC’s Scholarship/Education Committee, was the source for the idea and creation of the SEA. At the graduation, she praised the students for electing to spend their summer learning about the exciting career possibilities in the energy sector when they study science and technology. She also congratulated Sarah, Dom and Joshua for using what they had already learned in the program to conserve energy at home and to firm up college selections (Sarah is determined to attend MIT). SEA mentors and facilitators were: Sarah Ahmed, Christopher Brathwaite, Maggie Castillo, Nadira Choudhury, Konstantino Dimopoulos, Kayami Facey, Philippe Laurent, Pedro Santos, Mr. Williams and Ms. Silver. Members of the AABE-NYMAC and NYU-POLY team include: Albert Sanchez, Bill Suggs, Phyllis White-Thorne, Blondell Lighty, Lima Jones, Renee McClure, Dianne Fuller and Beverly Johnson.